Ladies, we’ve all had that trip where we overpacked and regretted it when we lugged a huge suitcase around a dream destination. This time, let’s be smarter, pack smarter, and look smarter! From brutal “wardrobe editing” to bringing anti-static spray, the following tried-and-true packing tips will have you traveling lighter and looking better! That old philosophy of “I’ll take lots of options and decide when I get there” results in unnecessarily heavy bags. So, let’s try a new plan: take fewer clothes to mix, match and re-wear. 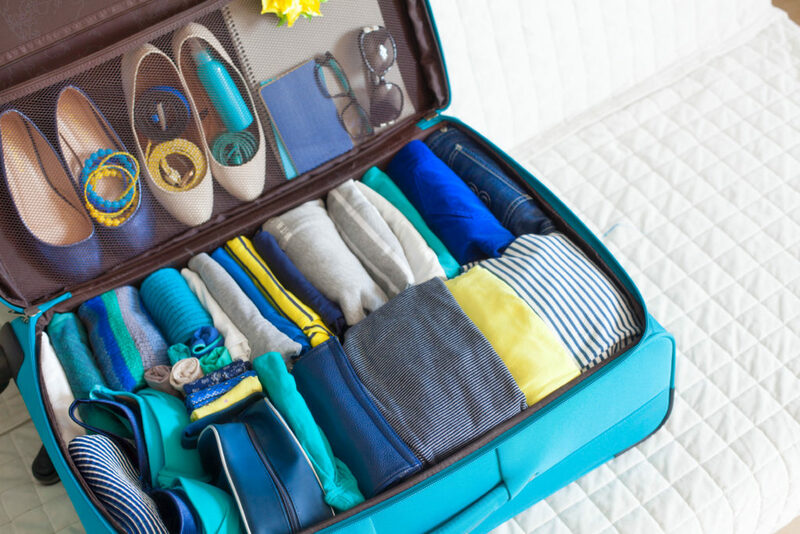 Lay out all the clothes you’d like to pack for your trip, and then take half of them away. Brutal editing should leave you with basics like blue jeans, black leggings, basic t-shirts, a simple dress or two, and a cardigan or jacket for layering. Add in a variety of colorful scarves, jewelry and accessories that can dress an outfit up or down and will give you lots of layering options. Travel experts agree that tightly rolled clothes take up less space than folded garments. This video demonstrates how to roll up shirts, pants and other garments so they pack more effectively and wrinkle less. Creases are where wrinkles happen, so this technique reduces that possibility. Take a secret weapon to handle wrinkles. Just to be sure wrinkles and static electricity don’t follow you around, pack a bottle of Woolite® Wrinkle & Static Remover spray in your suitcase. A good spritz with anti-static spray will have your clothes looking polished and ready for a new day. Pack at least one scarf. Scarves can have so many uses – an extra layer for an air-conditioned restaurant or a chilly evening, a cover-up if needed for a conservative location, a sarong, or even a blanket to sit on at a concert or picnic. It’s easy to achieve lots of different looks with just a few scarves. Even in the summer, pack dark colors. They are more forgiving of stains, show less wear and don’t become dingy. If your vacation rental or condo includes free laundry facilities, plan to use them. That way you can pack even lighter! Don’t forget the Ziploc bags. One- or two-gallon plastic bags will have a multitude of uses: keeping liquids from leaking onto clothes; organizing items like underwear and socks; packing dirty clothes or muddy shoes. Plastic bags take up practically no space and are invaluable on every trip. Vow to travel lighter on your next trip. Packing reusable bags and throwing in some anti-static spray will make you a smart traveler. You will never regret taking fewer clothes!